Google on Wednesday fired a shot across Apple's bow, unveiling a revamped version of its Nexus 7 tablet that's aimed at outdoing Apple's iPad mini at a lower price. The new Nexus 7 is the follow-up to one of the top-selling Android devices in that platform's burgeoning tablet ecosystem. The new version outdoes its predecessor in just about every way possible, with 1.8 times the CPU performance, four times the GPU performance, and twice as much RAM. The diminutive tablet still sports the same 7.02-inch display seen on the first Nexus 7, but Google and manufacturing partner Asus have significantly bumped up the resolution. The new tablet's display outputs at 1920x1200, with a pixel density of 323ppi. That's more than 50 percent higher than the original Nexus 7's 216ppi density, nearly twice the iPad mini's 163ppi, and higher even than the full-size Retina iPad's 264ppi. Showing off the device's display, Google called it the "highest DPI of any tablet on the market." The new device is also 6mm narrower and 60g lighter than its predecessor. Its larger battery adds an additional hour of video playback, as well as two more hours of web surfing. Google also added a 5MP rear camera to the device to accompany the 1.2MP front-facing camera. The rear camera is capable of capturing 1080p video. Google also showed off the newest build of its Android operating system, version 4.3. Still under the Jelly Bean moniker, version 4.3 brings multi-user restricted profiles, allowing users to set parental controls governing how other profiles can access in-app purchases. It also brings Bluetooth Smart integration, allowing devices running 4.3 to interface with low-energy, wearable devices. The Nexus 7 will be the first device to ship with the new operating system, and Google will be rolling it out to other Nexus devices shortly. The considerable bump in display resolution seems aimed directly at Apple, which held off on a Retina display when releasing the iPad mini last year, but has been rumored to be prepping a Retina iPad mini for release in the next year. Apple may well release a new model of its fast-selling smaller tablet with a higher-resolution screen, but current speculation has such a device on hold until early 2014. 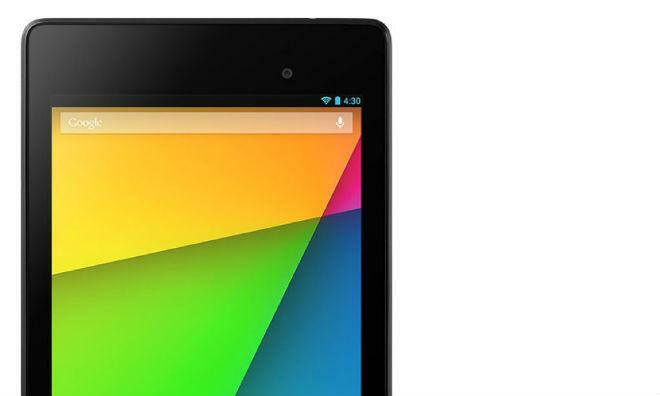 The first Nexus 7 debuted last year a few months before the iPad mini, and the device went on to solid sales. Late last year, the CEO of Asus  which manufactures the device  said his company was producing one million units per month. The iPad mini, though, debuted soon after and grabbed much of the attention in the small tablet segment. On stage, Google execs pointed to the growing presence of Android devices in a tablet segment Apple jumpstarted and by some measures continues to dominate. In terms of global Android tablet activations, the last two years have seen an explosion in the number of new devices, with Google now estimating the total number of activations at roughly 70 million. Roughly 50 million of those, according to Google, have come in the last twelve months. The new Nexus 7 will be available on July 30 from Google's Play Store, as well as a number of other retailers' online and physical locations. A 16GB Wi-Fi model will cost $229, and a 32GB Wi-Fi version will cost $269. Google will also be offering an unlocked 32GB Wi-Fi + 4G LTE version  compatible with AT&T, Verizon, and T-Mobile  for $339.